This guest post is from Katie Caputo, a registered dietitian who blogs foodie-inspired recipes at ktcaputo.com and tweets healthy tips and tricks @katiecaputo. Prior to moving back to Michigan, she worked for the California Beef Council. The Dietary Guidelines for Americans tells us to “go lean with protein,” yet many Americans are lost as to what “lean” really means when navigating the meat department. If you are like me, you purchase a cut of meat based on a recipe suggestion or what your budget allows, all while trying to factor in the “go lean” recommendation. Fortunately, the U.S. Department of Agriculture’s Food Safety and Inspection Service recently announced a new meat nutrition labeling rule that will hopefully help us to follow their “lean” recommendation, and make more informed purchasing decisions for our health. Flash back to 1993 when Nutrition Facts labels were first mandated on many foods. Meat wasn’t required to carry a nutrition label unless it was on processed meat products like bacon, sausage, or certain deli meats. Many fresh meat and poultry products like steak, tenderloins and ground beef have carried labels only voluntarily until now. 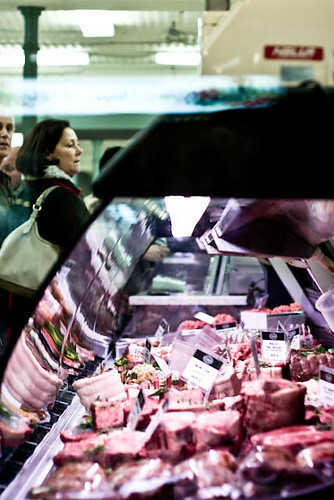 What makes nutrition labeling so important in 2012? With the growing concern over obesity and health, the Nutrition Facts label in the meat case is just another tool we can use to make educated decisions about what goes into our bodies. Meat and poultry products are nutrient dense and rich in protein, vitamins and minerals. If we want to “go lean with protein” while navigating the meat case, a Nutrition Facts label is an important resource to have on hand. Nutrition labels are required for 42 major cuts of meat and poultry, including beef tenderloin, pork chops, and chicken breasts. If the nutrition facts are not on the package, as in the case of some larger cuts of meat, look for posters or signs at the meat counter for this information. Ground and chopped meats — including raw hamburger, ground beef patties, ground turkey, and ground pork — must display the nutrition label right on the package. If the ground meat or poultry product shows the percentage of lean meat, it must also show the percentage of fat. For example, if a ground product says it’s 80 percent lean, it must also say it’s 20 percent fat. Nutrition labels or posters will include listings of total calories, calories from fat, saturated fat, protein, cholesterol, sodium and iron. The grocery store is the one-stop shop for learning about how food benefit our health, as many of us turn to food labels before putting a product in our basket. We have the right to know the variety of nutrients in our food and the nutritional benefits we receive from food products. Labeling in the meat case is a very important step that will make it easier for us to make more informed decisions about our food, which can result in building a healthy diet. What do you look for when buying meat?